Next summer will see the implementation of the EHF Championship in both the W17 and W19 categories for the first time and a total of 38 teams have entered the second tier competitions taking place in Georgia, Italy, Bulgaria and Lithuania. 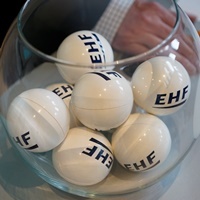 The draw event for all four tournaments will take place at 14:30 CET at the EHF Office in Vienna can be followed on the EHF EURO Facebook page and YouTube channel. Based on the younger age category competitions ranking valid for the W17 EHF EURO and W17 EHF Championships 2019, the participating teams are divided in two equal value tournaments as follows. The W19 EHF Championship events will take place in Varna, Bulgaria on 13 to 21 July 2019 and Kaunas/Klaipeda, Lithuania on 15 to 21 July 2019, with a total of 18 nations taking part. The full procedure for Wednesday's draw event can be downloaded here.